Home Tags Posts tagged with "nightclub fire"
Police have arrested four people in connection with a fire at Kiss nightclub that killed 231 people in Brazilian city of Santa Maria on Sunday. A co-owner of the Kiss nightclub handed himself in to police on Monday afternoon for questioning. Earlier, police held another owner of the club, a member of the band Gurizada Fandangueira, and its security chief. More than 50 of the victims are being buried on Monday. Brazil has declared three days of national mourning. The country’s deadliest fire in five decades reportedly started after a member of Gurizada Fandangueira, which was performing at the venue, lit a flare on stage. Officials are also investigating claims that many of those who died were unable to escape as only one emergency exit was available. The government postponed a ceremony scheduled for Monday in the capital, Brasilia, to mark 500 days to the 2014 football World Cup. In Santa Maria, 30 days of mourning were declared. “It is a tragedy for all of us,” she said. Authorities released the names of the victims, after revising down the death toll from 245. More than 100 people were being treated in hospital, mostly for smoke inhalation. The fire broke out as students from the Federal University of Santa Maria (UFSM) were holding a freshers’ ball, the Diario de Santa Maria, a local newspaper, reported. A local journalist, Marcelo Gonzatto, said the flare had “started a huge and fast fire that grew quickly and made a very dark and heavy smoke”. “Lots of people couldn’t get out and died mainly because of the smoke not the fire,” he said. Witnesses spoke of scenes of panic after the fire started, and a stampede as people tried to escape. A large number of victims were trapped in the club’s toilets, they said, possibly after mistaking them for an exit. 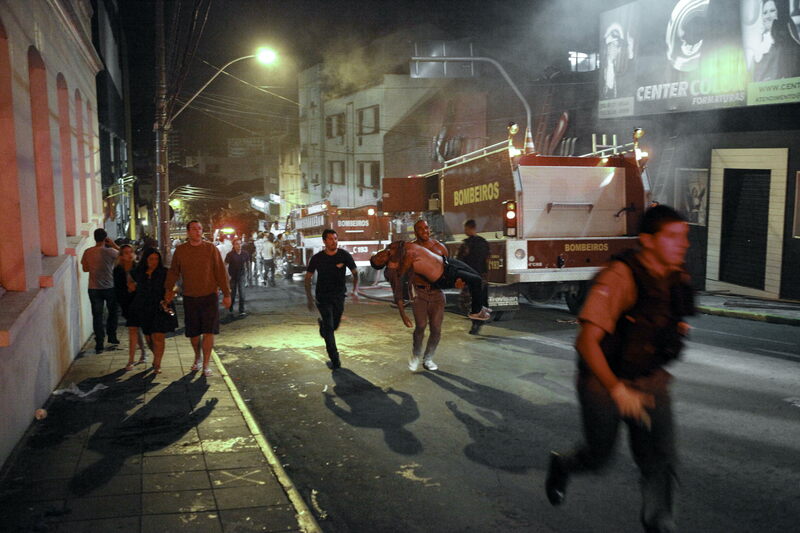 Survivors and police inspector Marcelo Arigony said security guards briefly tried to block people from leaving the club, the Associated Press reported. Bars in Brazil commonly make customers pay their whole tab at the end of an evening before they are allowed to leave. One of the owners of the club is reported to have confirmed that they were in the process of renewing its licence to operate, and that its fire safety certificate had expired last year. He is said to have received threats on the internet – as have surviving members of Gurizada Fandangueira. Its guitarist, Rodrigo Martins, told local radio: “It might have happened because of the Sputnik, the machine we use to create a luminous effect with sparks. He said the band’s accordion player had died in the fire. 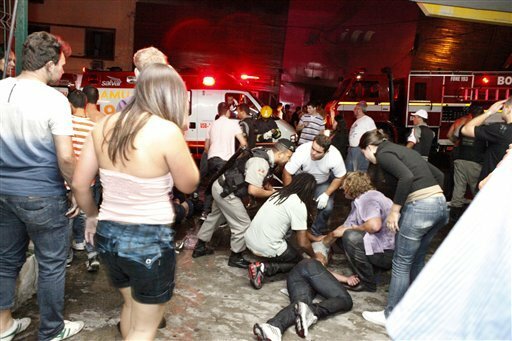 Brazilian broadcaster Globo said most of the victims were aged between 16 and 20. A temporary mortuary was set up in a local gym as the city’s main mortuary was unable to cope. Family members who came to identify the dead were led in one-by-one to see the bodies, Diario de Santa Maria reported. 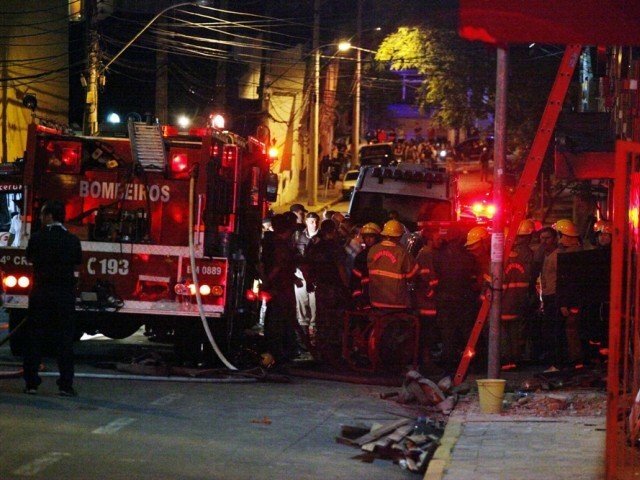 Brazil has declared three days of national mourning for 231 people killed in Kiss nightclub fire in the southern city of Santa Maria. The fire reportedly started after a member of a band playing at the Kiss nightclub lit a flare on stage. Authorities say most of the victims were students who died of smoke inhalation. The first funerals are expected on Monday morning. It is the deadliest fire in Brazil in five decades. Brazil postponed a ceremony due on Monday in the capital, Brasilia, to mark 500 days to the 2014 football World Cup. In Santa Maria, 30 days of mourning were declared. Authorities have released the names of the victims, after revising down the death toll from 245. 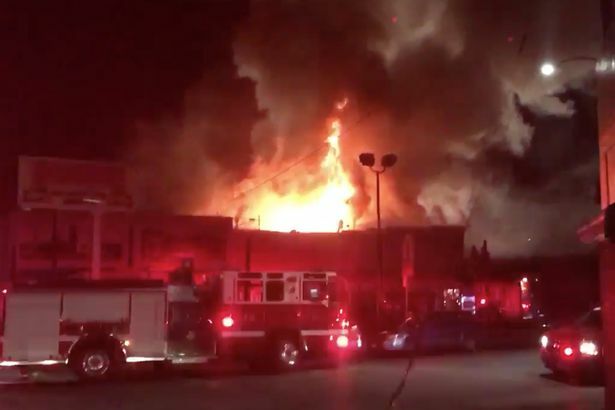 Officials will now investigate reports that a flare was lit on stage, igniting foam insulation material on the ceiling and releasing toxic smoke. They will also look at claims that many of those who died were unable to escape as only one emergency exit was available. The fire broke out as students from the city’s federal university (UFSM) were holding a freshers’ ball, the Diario de Santa Maria, a local newspaper, reported. Survivors and police inspector Marcelo Arigony said security guards briefly tried to block people from leaving the club, the Associated Press news agency reported. Bars in Brazil commonly make customers pay their whole tab at the end of an evening before they are allowed to leave. One of the owners of the club is reported to have confirmed that they were in the process of renewing its license to operate, and that its fire safety certificate had expired last year. He is said to have received threats on the internet – in addition to surviving members of the band that was performing on stage when the blaze started. A temporary morgue was set up in a local gym as the city’s main morgue was unable to cope. Family members came to identify the dead, led in one by one to see the bodies, Diario de Santa Maria reported. At least 232 people have died in a fire that swept through Kiss nightclub in university city Santa Maria in southern Brazil, police and officials say. The priority for the authorities is now to identify the dead with many distressed relatives arriving at the scene, but in the hours ahead the focus will turn to the cause of this accident and safety procedures at the club. The fire broke out some time after 02:00 when between 300 and 500 people are believed to have been in the club, where a band was playing. “The toxic smoke made people lose their sense of direction so they were unable to find their way to the exit,” said Dr. Paulo Afonso Beltrame, speaking by phone from Caridade hospital. President Dilma Rousseff said the air force had made “resources” available at an air base near Santa Maria to help.